There are many native plants available to me but now and then I need a special herb. An herb that is multi-purpose, easy to grow, and incredibly useful. 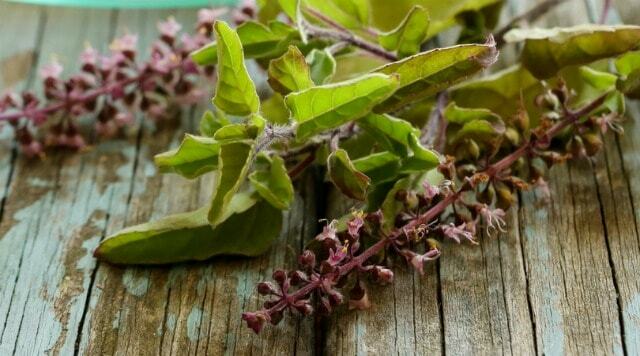 It is for these reasons that I grow holy basil and make tulsi remedies at home. Tinctures, salves, and syrups are all wonderful things. They do indeed have their place in our herbal remedy regimens. However, we should never forget the healing wonders of herbal tea. Tulsi is most traditionally taken as a tea and as drying herbs is a very easy thing to do, we can have lots of this herbal remedy within arm's reach. Tulsi is a gorgeous flowering herb. It's a delightful addition to the herb garden. Some varieties are even perennial for those of you in zones 10 or above. For the rest of us in less tropical zones, it can be grown as annual or brought indoors. I've grown it with great success in my zone 4b garden. Do give the seeds a good head start before transplanting outside in cooler zones. Holy basil has been used for centuries (and scientifically studied in recent years) for it's anti-oxidant properties. These same properties have detoxify the body and blood stream. Drinking the tea can help the body flush chemicals, we're all exposed too in our modern lives. Tulsi has been used to reduce stress, anxiety, and even depression. While the clinical studies focus on standardized extracts, a cup of holy basil tea after a long day is likely to help a person calm down. Every case and person is, of course, different but using a plant and a cup of tea as an attempt to keep the body and mind working well can't be a bad thing. This amazing plant also has anti-bacterial, anti-viral, and anti-fungal. It's been studied for its effectiveness on infections from food borne pathogens to cancer. Externally, tulsi can be used for healing wound infections. A cup of tea to drink or a tulsi compress on a cut can be a great way to keep the body free from infection. There has not been much study on the safety of Tulsi on pregnant or breastfeeding women. Until further study is made, it's is best to avoid if pregnant or breastfeeding. As tulsi can slow clotting, avoid before and surgery. Also check with your doctor about any medications – especially blood thinners. Obviously avoid if allergic. When in doubt talk with a trained professional about your unique circumstances. So if you need something beautiful and useful in your garden and home – consider holy basil. Use this fragrant and wondrous gift from nature as the gift it is and keep yourself running well. Thank you for providing us with natural remedies for so many ailments. 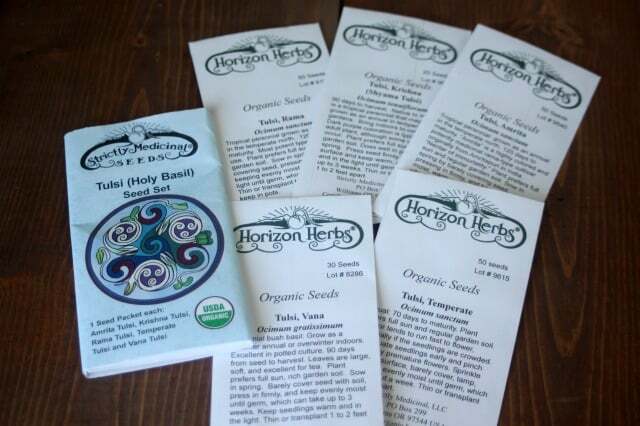 Strictly Medicinal seeds are awesome! I have a few Tulsi Temperate plants growing indoors right now..just love the tutti fruity flavor. Growing Tulsi isn’t in my garden plans. I’d love to win the seeds and give it a try. It’s one of my favorite teas. Hope to make this plant a part of my garden! I have been looking for Holy Basil seeds and would love to win these to add to my herb supply. I have done some reading on it before and am very impressed with it’s healing properties. Although I am planning on greatly expanding my herb garden this year Tulsa had not been in my plans yet but I would love to add it. Thanks for the chance to win! Thanks for the chance to win I’ve never grown or used holy basil, it certainly seems like it’s a should be grown item! I grow basil, but haven’t ever grown holy basil. I’ve been thinking about adding it to my medicinal herb garden. I have been growing Tulsi for about a year. I use it to help with chronic back pain. I have never grown holy basil, but I am going to after reading the benefits!! It sounds enticing. I think I will try to get it planted. I haven’t grown Holy Basil because I haven’t found any around where I live. I would love to have some. Thanks for all the wonderful information. I would love to make Tulsi my herbal experiment of the year. Thank you for the opportunity. I love Tulsi Tea, and would love it in my garden, for some reason, I had no idea I could grow it at home! Excited to add some new herbs to the garden, thank you for the opportunity! Thank you for sharing your knowledge for a simpler natural way of living in this world. It’s occurred to me to add it, but I haven’t yet. Even if I don’t win these seeds, I shall definitely grow holy basil this year. I grow culinary basil successfully here in Utah, and look forward to similar success with Tulsi. I also look forward to trying out the tea and seeing if it will really reduce the stress!! Wanting to grow many Medicinals this year! Absolutely! I do have a small pot that a friend gave me and I have been wanting to expand the herb garden with tulsi. I just double checked to be sure, in some climates, Tulsi and all in the family of Lamiaceae can be invasive in some areas. When I lived along the coast, I always had to grow all of them in containers unless I planned to use them as a groundcover in that area. Since moving, I’ve had to buy it dried and would love to try it here in a desert climate in both containers and in the ground. I’m still learning this climate and soil…plus fighting with a much smaller space and HOA gardeners. 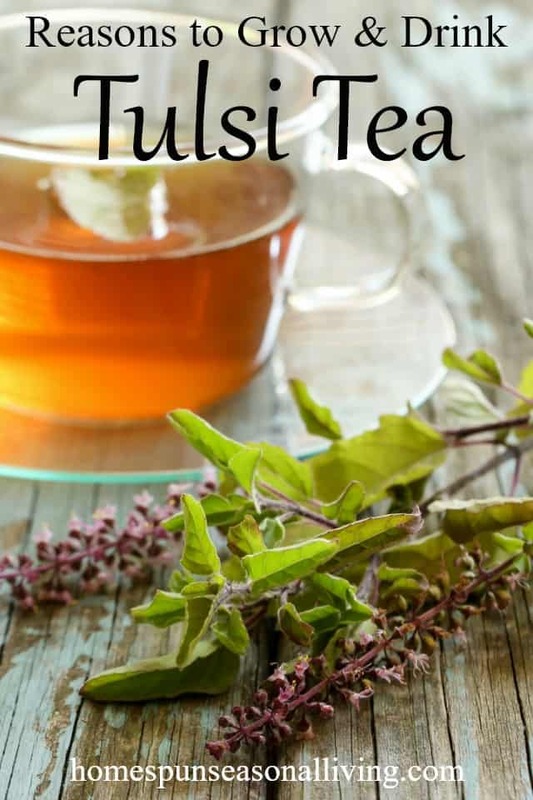 I have purchased Holy Basil tea and it is wonderful, I would love to grow it in my garden. Tulsi is a magnificent herb! I am definitely planting it in my garden! I would love to include Tulsi in my garden! Thanks! Yes, I have been growing Tulsi for several years…would love to start from seed, and I always donate extra herbs and vegetables, as well as fruits to our local Blue Ridge Food Bank. Thank you for all you do! I would love to grow tulsi this year. I have never grown it before, but this is the year! I am just starting a herb garden and this looks like a must. I just recently heard of tulsi and did not realize that is another name for holy basil. I have wanted to grow it but didn’t know it would grow in my area. Growing as an annual would work for me. I am excited to try it this year. Thank you for this great newsletter! This is my first year trying to grow herbs, and Tulsi is one I am exited to start using. Thank you for the great newsletter. I have a deep love for holy basil. I grow it every year in the border around my vegetable garden. Bees and butterflies love the blooms. Produces a great many seeds! Strictly Medicinal seeds are awesome! I grew Tulsi for the first time last year. Loved the smell but wasn’t sure how to harvest and use the plant. Interested in learning more. Holy Basil,Tulsi, as Ocimum Sacrum is growing inside right now and I love this plant. I would love to introduce the other varieties of Tulsi in my indoor and outdoor Garden. I haven’t experimented with Ayurvedic remedies much previously. It would be such a pleasure to learn about Tulsi first hand! This article is perfectly timed as I’m in the process of laying out a new herb garden. Tulsi will definitely be included. Just in time, planning a new garden area right now. Loved the article. Not currently. I have 3 other basils. Would love to start Tulsi! No, Tulsi isn’t a part of my garden…yet ;). Yes! I drink tulsi tea as an adaptive and can’t wait to plant it! I ordered 1 packet of the “original”, but would love to add it’s brothers and sisters to the garden ? Along with a few other medicinal herbs like yarrow, ashwagandha, and lemon balm, I would love to have Tulsi as a great addition to my first medicinal herb garden that in starting this year! I love Tulsi. I’ve picked her flowers and made a hydrosol with them in the past and it is wonderful. I use it for a calming effect and it works. I’ve never used holy basil before. I’d love to try some in my garden this year! I use dried Tulsi as one of my herbs in an infusion for my acne soap and a herbal healing salve. I also use dried tulsi as one if my herbs to make a tea for to make an acne toner. I have tulsi (holy basil) EO that i put in my acne topical zit zapper. I have never thought about it as a drinkable tea – which now that I think about it, is just stupid on my part. Thank you for the Blog info! Love it and much appreciated it. Tulsi is definitely in the plan for our farm. There is a wild version that grows already, and I’d love to add the other varieties. Nice post! I love trying new seeds and would love to try these seeds. Thanks for offering this giveaway. Regular basil is always a part of my garden, mainly for pesto. I have tried growing a few varieties but never Tulsi. I love it in Thai dishes and would certainly try it in my garden. I grow a variety of herbs, but not holy basil. A friend uses it for her sinus infections. I’ve searched locally for the plant or seeds for 2 years. Maybe this year is the year?! Hopefully, I’ll win a packet of the seeds so I can grow plants too. Thank you for this opportunity! I was on the verge of ordering this seed set when I discovered an old packet of Ocimum Sanctum from Botanical Interests in my stash. So I thought perhaps this is not the year and pared down my list. But I’m always curious about the blend of varieties used in the plain Organic India tea bags- my main source thru the years. Looking forward to someday getting to know them individually and to sharing this experience (and seeds) with other tulsi-curious. I have grown Siam Queen thai basil in the past which brings me great pleasure to experience in abundance. Happy gardening all. I love growing Tulsi in the garden. I’ve grown temperate/Kapoor for several years. I know the other varieties take much longer, I’m curious when you recommend starting them indoors. I’m zone 4 as well. I haven’t grown Tulsi yet, but would like to try it. This is one of the plants I am planning to grow for my course at the Chestnut School of Herbal Medicine Immersion program!!! Whst perfect timing! Love Tulsi tea. Can’t wait to try my hand at growing my own. After reading about it, I do plan on planting it this year. Tulsi is not currently on my list, but I’d surely try it. Thanks for this opportunity. I have been looking for Tulsi seeds for the past several years on Amazon, but haven’t been able to find any. Seeds of Change used to offer them. Thanks for sharing this source. Love Holy Basil! I use it in homemade teas, tinctures, & elixirs. I started some Tulsi Rama & Tulsu Amrita seeds in my greenhouse. Would love to try all these different varieties! Thank you for a chance at this giveaway! Thanks so much for the great ways to use Holy Basil. I would love some actual recipes because I have a pound of dried leaves to use up.